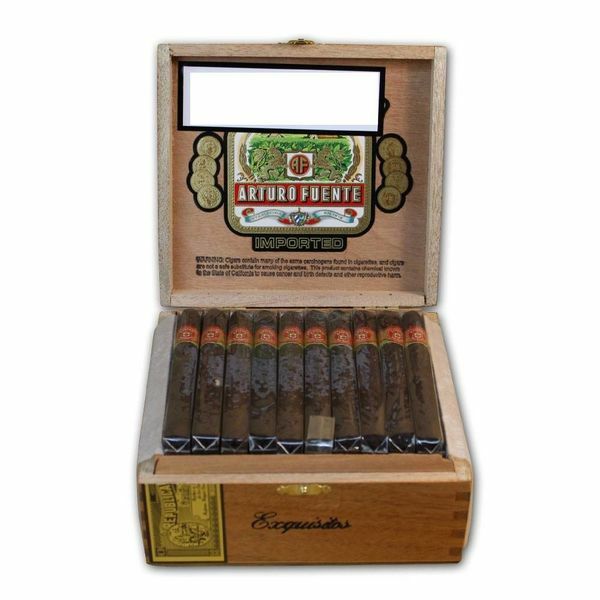 The Arturo Fuente Gran Reserva series is the flagship of the award winning Arturo Fuente brand. Representing four generations of family tradition, every Arturo Fuente cigar carries the personal family craftsmanship that makes it one of the world’s best cigars. Only the highest quality aged tobaccos go into these pure beauties. Each leaf is hand selected from a private reserve set aside solely for the purpose of making these cigars. These rare tobaccos are internationally recognized for their superiority. The cigars are then hand rolled with a variety of wrappers. Every Arturo Fuente Gran Reserva cigar is an elegant cigar without parallel. Arturo Fuente Gran Reserva Exquisto is composed of Dominican filler and binder with a U.S Connecticut Broadleaf Maduro wrapper. In traditional Fuente fashion this aromatic cigar is further enhanced by being aged in Spanish cedar vaults. A small, handmade medium-bodied, long filler cigar, it is a surprisingly sweet cigar though not overbearing. The Gran Reserva Exquisto is perfect with coffee, during lunch breaks, or whenever you have the time to enjoy a brief yet very palatable smoke. I’m still on my search for the best Cuban sandwich, and on my travails I came across a quasi- Cubano at Cuban Breezes in Tampa. They serve a classic Reuben with a Cuban twist! I love Reuben sandwiches, so I could not pass up their version. The Reuben consists of sliced pork, pickles, cheese, sauerkraut and Thousand Island dressing on thick-sliced sweet Cuban bread. This might be my new favorite sandwich. Cuban or Reuben!